Let’s explore a topic that has the potential to really disrupt the analytics and data visualization space if it comes to fruition. That topic is immersive intelligence, which is a new kind of visualization. I’ve written in the past about how important data visualization is becoming and why people are embracing it (see here and here and here). I also hosted a webinar for the International Institute for Analytics recently about how to profit from big data and visualization in which I introduced immersive intelligence as a concept (to view the archived webinar, click here). How do we achieve that vision and what does it mean in practice? It all starts with video game technology. Video games in recent years have driven the creation of incredibly robust and realistic graphical environments driven by sophisticated graphics engines. These gaming environments are becoming eerily realistic. Why can’t the same graphics processing power developed for games be used to create immersive dives into our data? It doesn’t seem like a big leap to me at all, and I doubt it will to you either. Can Big Data Help Save The Environment? Next, we add on new enabling technology. Facebook paid $2 billion (yes, that is billion with a B!) to purchase Oculus and its Rift technology this past year. The Rift technology is on the verge of making truly immersive worlds available in a way that will seem highly realistic and also won’t cause motion sickness (which has been an issue with past technology). With technology capable of delivering graphics as sophisticated as we can generate, how do we drive value from big data, analytics, and visualization? The answer is that we will hopefully soon see options to almost literally dive into our data to explore its features with immersive intelligence and we’ll be able to invite others into our data worlds and show them around. The early examples of this approach are impressive even though they only scratch the surface. Below is a screen shot of the proposed US Federal Budget with detailed descriptions and spheres scaled to the proposed budget amounts. Wandering through this immersive intelligence visualization, one obtains an intuitive sense of the structure of the US budget, along with its balance (or imbalance) among the various government agencies. The image was created by Eric Hackathorn of the National Oceanic and Atmospheric Administration (NOAA). 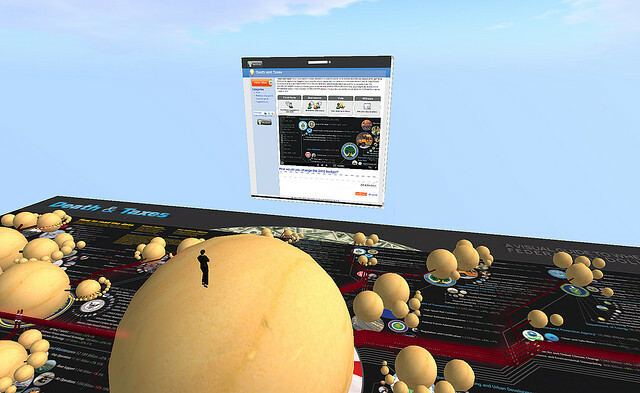 Yes, that is Eric’s avatar perched upon DoD budget, and if you visited the virtual world instead of a screen shot, you could fly around and explore all of the data directly. Click on the image to see more information. Physicists can create immersive worlds to watch the interactions of particles as different conditions are applied, which will help along their research. Scientists can create worlds where the folding of proteins can be viewed in detail. Analysts can watch how iterations of an algorithm change how data points are classified to better understand how the algorithm is working. Manufacturing executives can check current operating conditions of any piece of equipment in any plant by literally walking their avatar through the visual representation of each plant and viewing current stats on each piece. There is no doubt that immersive intelligence is still an edgy idea that hasn’t been widely adopted. However, the technology is here to make it possible and I suspect we’ll start seeing more of it soon. This will be especially true as those championing the cause develop more examples that capture our imaginations and help us to see the potential. In fact, Richard Hackathorn will be providing some terrific new examples of immersive intelligence in a talk we’ll do together at the Teradata Partners conference in Nashville, TN in October. We hope to see you there! Bill Franks is Chief Analytics Officer for The International Institute For Analytics (IIA). Franks is also the author of Taming The Big Data Tidal Wave and The Analytics Revolution. His work has spanned clients in a variety of industries for companies ranging in size from Fortune 100 companies to small non-profit organizations. You can learn more at http://www.bill-franks.com.